Washington, D.C. lawyer Richard D. Heideman was recently chosen as the president of the American Zionist Movement. Who Heideman is, what AZM is and what Heideman’s leadership might mean for American Zionism were discussed when the JewishPress.com sat down with Heideman during his recent visit to Jerusalem. While still in high school in Detroit, Michigan, Richard D. Heideman attended a B’nai Brith Youth Organization Summer Leadership Program at which he met and listened to “a lanky man with wild hair – Elie Wiesel!” speak about the horrors of the Holocaust. Heideman chose as his theme for his year as (one of the youngest ever) presidents of BBYO, Jewish Survival. That continues to be his theme, perhaps with an even greater sense of urgency, as Heideman began his tenure as president of the American Zionist Movement this spring. Heideman’s vision as leader of 25 disparate Zionist organizations and youth groups is impressive. In the hands of a lesser man the vision might be scoffed at as fanciful. But if anyone can provide leadership to groups that span the spectrum from the Zionist Organization of America to the BDS-supporting Partners for a Progressive Israel, Aytzim (Green Zionist Alliance), the prog-left Aimenu, and the Religious Zionists of America, Heideman is one to put your money on. “I see it as my strongest mandate to unapologetically seek to renew our basic Zionist principles and to work to repair the good name of Israel, the Jewish people and Zionism itself,” Heideman told the JewishPress.com. “Modern political Zionism is the right of the Jewish people to sovereignty in their ancestral and indigenous homeland,” he continues, but he recognizes that the term has been manipulated into something unseemly and widely disrespected. He plans to change that. Heideman and his leadership seek to implement what they call their “Zionism Forward” message with a three stage plan. These are: Education about Jewish history and the Hebrew Language; Creating a Unified Jewish Voice; and Advocating for a better Global Policy. Before explaining how he and his team intend to implement this vision, Heideman explained why the Zionism Forward plan is necessary. “What is the worst thing someone can say about you?” Heideman asks. “That you are a racist.” Heideman explains: Zionism has been hurt by years of public discourse in which Israel is described as bad, Jews and Zionists are described as bad and Zionism is described as equivalent to racism which is, ipso facto: bad. Heideman recounted his years spent as a front row witness to the global assault on Zionism. He was in Nairobi as an NGO delegate at the 1985 United Nations Conference on Women. He watched in horror as the conference was hijacked from its mission to improve the status of women into an all-out assault on Israel with claims that Israel tortured and killed children to drain their blood. In 2001 Heideman served as Head of Delegation to the UN World Conference against Racism in Durban. Instead of an honest inquiry into racism and how to combat it, that UN event became one long assault on Israel which was placed in the dock as the single worst practitioner of racism. Both the US and the Israeli delegations walked out in protest. Heideman wrote and filed a brief at the International Court of Justice in 2004, on behalf of an American NGO arguing against the tsunami of lies claiming Israel’s security barrier was illegal. 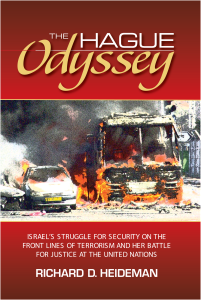 While the Feb. 2004 sham hearing at the ICJ was taking place, Heideman served as the chief trial counsel for a parallel tribunal held nearby for the familes of the victims of the terrorism which the security barrier was intended to stop, highlighting Israel’s right to defend her people. Heideman later published a book about what happened at the Hague. This parallel hearing allowed the victims’ families – who were not permitted into the ICJ hearing – to tell their stories and give proof to the need for the security barrier. Richard D. Heidman (left) as Arnold Roth (right) speaks at Families of Terrorism Victims event Feb. 24, 2012, at the Hague. Roth described to JewishPress.com that he learned about Heideman’s legal skills in obtaining judgments “against a rogue’s gallery of jihad-involved states including Iran, Syria and Libya,” and of litigation on behalf of families of victims of terror. A few years ago, Roth’s wife and children asked Heideman to represent them in such a lawsuit. Heideman obtained a multi-million dollar judgment (which has not been paid) against the Islamic Republic of Iran for funding the Hamas terrorists who carried out the Sbarro homicide bombing. In Nov., 2015, Heideman testified at a Senate Intelligence subcommittee hearing about the US government’s responsibilities to American victims of terrorism. His legal acumen and superb speaking ability are invaluable assets for someone called upon to lead a disparate group of Zionists, the combined membership of which, Heideman is told, numbers close to a million. But Heideman also has the knowledge base on which to draw for this new endeavor. He studied political science, international relations and conflict resolution at the University of Michigan. While a student at the National Law Center of George Washington University in Washington, D.C., he spent his summers at Hebrew University studying the legal aspects of the Middle East conflict, as well as the comparisons of the laws of Israel and its Arab and Muslim neighbors, including sharia law. Uniquely positioned as the international president of B’nai Brith International during the end of the Clinton era and the beginning of the George W. Bush era, Heideman’s tenure also coincided with Benyamin Netanyahu’s first term as Israel’s Prime Minister. His political knowledge and acquaintance with leadership in both the United States and Israel is broad, another valuable asset. Heideman draws a timeline to reveal what he believes led to Israel becoming, despite all the evidence to the contrary, the pariah nation of the world. The timeline starts with the Balfour Declaration and follows with the San Remo Conference, the Sykes-Picot Plan, the Shoah, the formation of the United Nations, the Nuremberg Trials, the establishment of the definition of genocide, right through to the UN’s 1947 Resolution 181 – the original expression of the Two State solution (which was completely rejected by the Arab nations). Heideman explains that the Jewish people’s legal right to their historic homeland has been hard fought and exhaustively documented. The legal right of Jews to a Jewish Commonwealth in their ancestral home was cemented further by their improbable but undeniable military victories in successive defensive wars, in 1948, in 1956, in 1967 and 1973, Heideman continued to explain. Given Israel’s historic, legal and military bases supporting her rights to her ancestral homeland, the Arabs turned to a different path. “If we cannot beat her on the battlefield, and if the strongest nation, the United States, backs Israel, then we will turn to diplomatic warfare,” Heideman intones, echoing the latest and thus far most successful Arab strategy. “We will paint Israel in the worst possible light and have the imprimatur of the world’s body repeat and endorse this image,” Heideman completes the thought. He then circles back to his earlier point, the equating of Israel and Zionism with racism and its concretization in the 1975 UN resolution. So Richard Heideman is committed to re-energizing the term Zionism, wresting it back from the refuse bin. He intends AZM to embark on an educational endeavor, sharing the vibrant history of the Jewish people and the Jewish Homeland. This endeavor will have a special focus on the current generation, reared in an era in which Zionism, especially on college campuses, is near-fatally tainted with the gravest sin of racism. But Heideman still has an uphill battle, despite his near-perfect constellation of background, skills and vision. Given the wide swathe of the political spectrum represented by AZM organizations, speaking with a unified voice about what Zionism represents and how it should be supported and defended is daunting. Heideman explained that he and the new AZM executive director, Herbert Block, intend to accomplish this by determining and elucidating commonality amongst the member organizations through a series of meetings with each one’s leadership, in order to sift through polices and plans and reveal what is shared. Heideman does draw a few personal lines in the sand: boycotting Jews or Jewish businesses, Holocaust denial and terrorism. About religious boycotts he says: “It is discriminatory, disgraceful and must be denounced,” and he will continue to advocate against it, as he has done in the past. What about boycotts of Jewish businesses located beyond Israel’s so-called Green Line?Heideman is asked. “Boycotting of Jewish businesses anywhere is wrong,” he replies. Then can he support, for example, AZM member Partners for a Progressive Israel marching in the Celebrate Israel Parade in New York – a group which exhorts its members to boycott Israeli products made in Judea and Samaria? Heideman says AZM will respect the right of every constituent organization to march in the parade, whether or not there is agreement on certain positions. Holocaust denial is “inherently wrong and I have no hesitancy in denouncing the sickness of any efforts to do so,” Heideman says about his second line in the sand. The Holocaust is something that looms large in the Heideman household as his wife, the Hon. Phyllis Greenberg Heideman, is the president of the International March of the Living, and a former member of the US Holocaust Memorial Council. The Heidemans were in Jerusalem earlier this month as the culminating step of this year’s March of the Living. A third line in the sand, one against which Heideman is steadfast and immovable, is support for or justification of terrorism. “The use of heinous murder and terror as a weapon is unconscionable, a violation of human dignity and international law, and we must all stand against it,” Heideman firmly states. AZM is currently planning a conference to “combat those who seek to demonize Israel and Zionism.” The timing is still being worked out, but it is scheduled to take place sometime between October and the end of December. 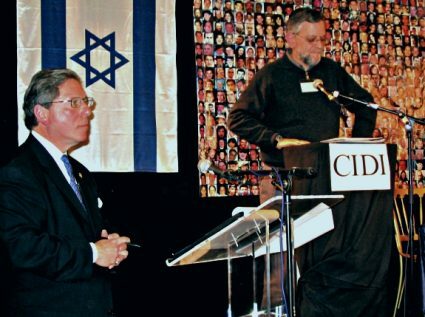 This article has been updated to reflect that Heideman was international president of B’nai Brith International during the end of the Clinton and beginning of the Bush presidencies, not president of BBYO in that time period. Article written by Lori Lowenthal Marcus and published in the Jewish Press.